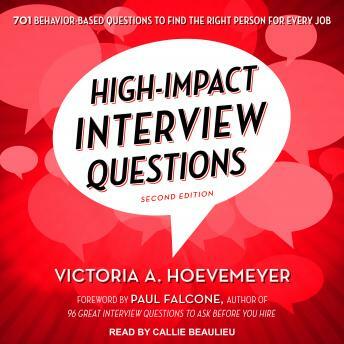 High-Impact Interview Questions shows you how to use competency-based behavioral interviewing methods that will uncover truly relevant and useful information. By having applicants describe specific situations from their own experience during previous jobs (rather than asking them hypothetical questions about 'what would you do . . .'), you'll be able to identify specific strengths and weaknesses that will tell you if you've found the right person for the job. But developing such behavior-based questions can be time-consuming and difficult. High-Impact Interview Questions saves you both time and effort. The book contains 701 questions you'll be able to use or adapt for your own needs, matched to sixty-two in-demand skills such as customer focus, motivation, initiative, adaptability, teamwork, and more. It allows you to move immediately to the particular skills you want to measure, and quickly find just the right tough but necessary questions to ask during an interview. Asking behavior-based questions is by far the best way to discover crucial details about job candidates. High-Impact Interview Questions gives you the tools and guidance you need to gather this important information before you hire.